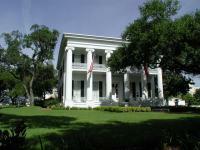 First built in 1854, this Greek Revival mansion housed its first governor in 1856 and continued to do so through 2008. That span made it the longest inhabited house in Texas and the fourth longest inhabited governor's residence in the entire nation. This impressive run was cut short by a suspected arsonists who torched the mansion on June 8, 2008 while it was in the midst of major renovations. 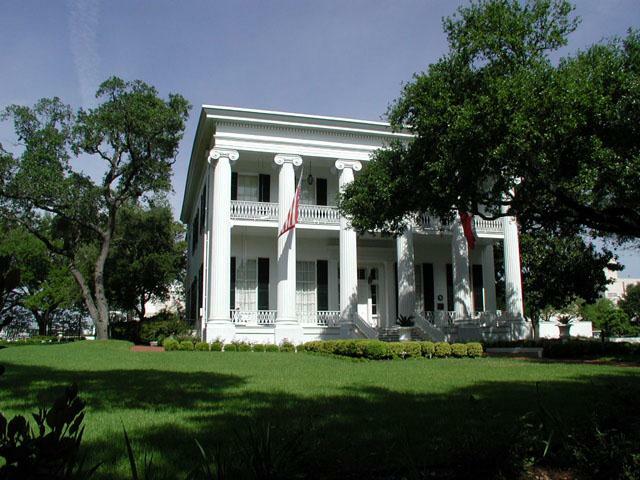 The Governor's residence as it appeared in 2003. Thinking it appropriate for the state's governor to have a residence in accordance with his station, the legislature allocation $17,000 for the construction and furnishing of the mansion. Abner Cook, the architect of many of the grand buildings of the day, designed the building that was placed on a 2 acre lot just southwest of the Capital personally chosen by Governor Elisha Pease. Bastrop County pine logs and locally made brick were used throughout the structure. The original residence included no bathrooms as indoor plumbing was not added until the 1880's. Air Conditioning was added in the 1950's during the appropriately named Allan Shivers administration. In 1914 it was expanded from 6,000 to its current 8,920 square feet. Governor James Hogg was so annoyed by his children sliding down the banister of the main staircase that he nailed tacks into them. The filled in holes of those tacks are still visible today. One fortunate outcome of the arson committed on June 8, 2008 was that since the property was undergoing extensive renovation, all of the priceless antiques and historic artifacts that have come to grace the governor's mansion had been removed and placed in storage elsewhere. Since the governor and his wife were residing elsewhere and practically all of the contents of the house removed the lower vigilance in security may have played in role in not stopping the arsonist or the fire sooner.